On Sunday, Madden 19 Ultimate Team gamers got quite the treat. The MUT crew revealed a brand new group of Ultimate Team Power Up players based on gamers’ feedback. 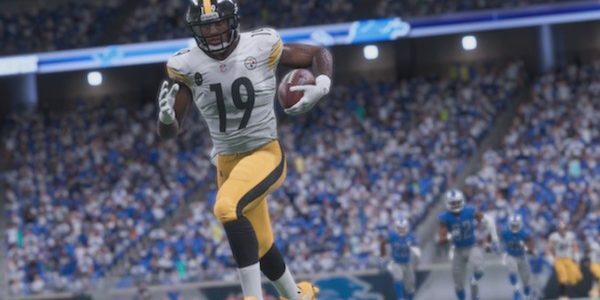 Several additions in the latest group are going to make various MUT enthusiasts quite happy too including TOTY star JuJu Smith-Schuster. However, there are still a few NFL players being mentioned as overlooked in Madden’s Power Up world. While the Pittsburgh Steelers may no longer have cover athlete Antonio Brown or 2018 holdout Le’Veon Bell, they still have JuJu Smith-Schuster on the roster. MUT gamers were begging for a Power Up card for the Team of the Year player, and as of Sunday, their wish was granted. Smith-Schuster leads the way for a group of 10 new Power Up players that also includes Chicago Bears’ defender Roquan Smith. The Power Up player cards are a part of the Madden 19 Ultimate Team feature. With these particular editions of cards, gamers can power up their overall numbers to make them better on-field for offense, defense, or special teams. The 10 players revealed in the tweet below had yet to receive these particular upgradable cards in Ultimate Team. ICYMI: @Muthead reveal of today’s Power Up Players. The Indianapolis Colts’ Adam Viantieri makes his way into Power Up mode. Other players revealed in the new Power Up group include Chargers strong safety Derwin James and tight end Antonio Gates. There’s two Rams players with center John Sullivan and Aqib Talib, as well as Texans’ defensive tackle Grady Jarrett. Broncos right end Bradley Chubb and the Lions right tackle Rick Wagner round out the 10 new cards in MUT. The release of these Power Up cards is great for some gamers, but others are still calling out some deserving names. Cleveland Browns quarterback Baker Mayfield is amongst those topping the list. Another player being mentioned in the feedback a lot is the Green Bay Packers’ Jaire Alexander. Both players seem due to have upgradable cards. It should be interesting to see if Madden Ultimate Team obliges these particular requests or others moving forward. Gamers, which player(s) do you feel deserve to have power up cards the most? Get more of the latest Madden 19 news here.